Mouse has been writing a lot of stories lately. Her first story with any kind of recognizable story arc was about… A princess. Of course. It has had me thinking quite a bit about fairy tales, and the power of narrative over our lives. It is a chicken and the egg question, of course, whether narrative informs our world or it is the other way around. A realistic guess is that it goes both ways. At any rate, my six year old has given me more to ponder than I’d ever expected. Here is her story, with spelling corrected for ease of reading. There was a princess. Her name was Princess Rose. Her palace is beautiful. She found a prince. He was not nice. But Rose had always wanted a prince. But she would not marry a mean prince. So she stopped looking. After a while she looked again. The mean prince was still there. She wondered why he stayed. She said, “Do you wish you were married?” He said yes. She did not actually want to marry. She was not talking anyone, until she couldn’t hold it. They tried to marry until she said, I can’t marry. So he got on his horse and rode away. After the mean prince left, she wondered, would she find another prince that is nice? Yes, she did and his name is Tom. They watched each other for a while. This is this a new prince,” she thought. She said, “Can we marry?” Tom said yes so they did. Here is a picture of the first page that I shared weeks ago, before I realized her story was going to send me down the rabbit hole of contemplation. So you can imagine that I was confused as to why Rose got engaged to the mean prince, fully knowing he was mean. I asked Mouse why this was. Her answer? Rose did not want anyone to think that she was mean. Not only that, Rose thought by marrying him, he would learn to be nice. Apparently, he couldn’t help that he was mean; no one had taught him to be nice. Huh. It gave me real pause to consider that my six-year-old daughter already has gotten the message that women are expected to sacrifice themselves to others in the name of being “good”. She might not be able to articulate it beyond a little girl’s princess story, but it is clear to me that the message has been delivered. Mouse explained more of the story to me. Rose was extra careful the next time (this is why she and Tom “watched each other”), because she did not want to get stuck with another mean prince. I pointed out that if the new prince was mean, she could always choose to call off the engagement, or that maybe she doesn’t need to be with a prince at all. Mouse repeated that Rose really wanted a prince. More importantly, if Rose kept calling off engagements, no more princes might come, knowing that she was so likely to say no. Huh. So Rose waits, protecting her reputation, and then makes the first move once she is confident. Ok, I thought, this is good. I liked that in her story, a good man can wait for the woman to approach on her own terms. I’m so weary of unreasonable fairy tales that promise happiness for women who compromise themselves. Little mermaid Ariel, change your body so you can find love. Belle, go live with the mean angry beast to please your father. Better yet, return to captivity and you’ll be rewarded beyond imagination. Cinderella, don’t make waves for your father, endure abuse and neglect and one day a different man will pluck you from that hell and all will be right. I could go on, but you get my point. You can tell I’m not a Disney fan. And don’t tell me that this stuff doesn’t matter because they’re too young. Kids are sharp, they get it more than they let on. I have been reading the commentary around the Fifty Shades of Grey movie, and while I think both sound pretty ridiculous (I did read the first book out of curiosity and vow not to partake any further), I can’t help but think, goodness, how is this not a fairy tale all grown up? I’m not judging anyone’s fantasies. What we imagine in the privacy of our own minds doesn’t have to be laid bare for public critique. The question is more about what we choose to elevate, what grips us and why. Virgin finds impossibly seductive millionaire with violent desires to control his romantic partners. She surrenders against her better judgement yet all ends well. Fifty Shades of Grey promises to be a dark fairy tale for adults, complete with a modern day equivalents of a palace, chariots, and even a dungeon. It is the “bad boy” story that goes right. But just as I’ve never heard anyone’s captor turning into a kind prince with a magical kiss, I’ve never heard of a real life example of an abuser miraculously reforming simply because someone loved him or her enough. I can’t seem to get Mouse’s story out of my mind, because it reminds me that my children will one day meet mean princes and Christian Greys. Men who might appeal to their sense of “good” in order to draw them into dysfunctional or, even worse, abusive relationships. 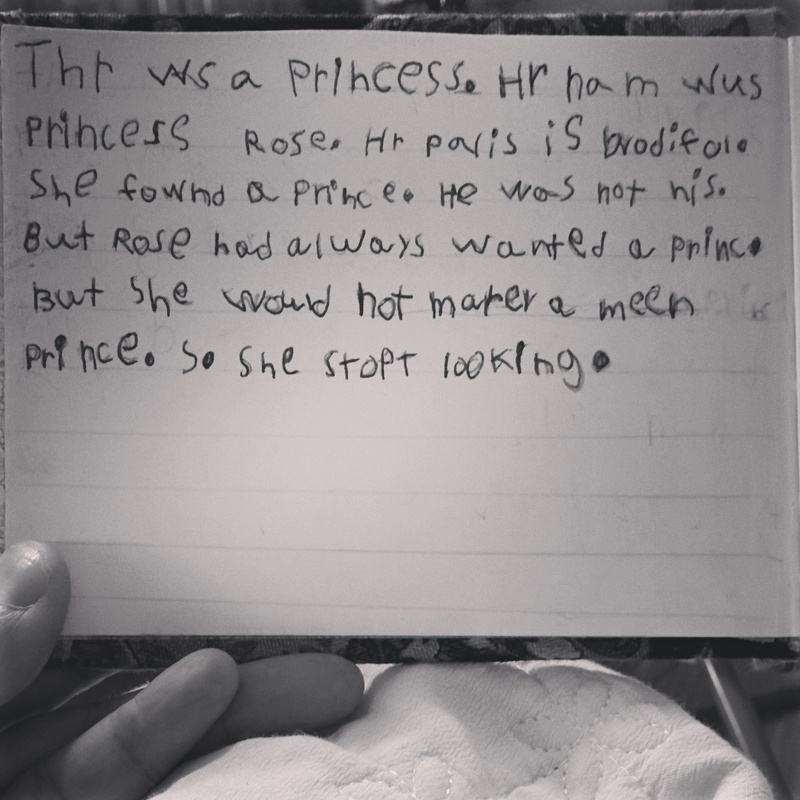 I’m glad that my daughter’s princess story doesn’t end with her surrendering to the mean prince. Whether her six year old musings will carry over into her real life decisions, well, I lose some sleep over that. From the vantage point of a woman who has raised both a daughter and sons, I am struck right away by how thoughtful Mouse is in her writing, and how strong her Princess really is. After all, she tried to be “good” but that didn’t make her marry the mean guy. She ended up getting what she wanted! She sounds like a power woman already! Thank you for those kind words, I’m feeling hopeful! I keep trying to make her write a sequel to the princess story but so far, no dice. I love that she loves to write! I hope that she can hold onto that joy as she gets older. Hopeful that “ed reform” doesn’t get in her way as a story teller! What a perceptive little girl, that mouse of yours! She did what even Tolstoy couldn’t. Her Anna didn’t have to meet a tragic fate in the end because she walked out on a man. No sir. Mouse’s Anna is real and strong and finds her happiness on her own terms. Beautiful story! What a clever, thoughtful and strong little princess you have! Pretty scary how much the “mean prince” sounds like some of my past relationships! (Except I was the one who rode away on the horse.) Maybe it’s a good thing she is working all this out beforehand….